I got these Arganese Cigars just a couple of days ago, and i could not keep myself from testing one. I have to admit, that i have found me a new favourite passtime cigar. The corona sized Arganese Chairman with the Maduro wrapper is a great cigar in many ways. The unlit fragrance was smooth overall, but had a lovely punch in it too. when lit i noticed immediately, that the draw was pleasant and the burn extremely even. Nicely costructed cigar in all. The first couple of draws reminded me of somethin like freshly cut grass. On the second third of the cigar, more aromas and flavor built up. Now the grassy taste gave some room for a flavor distinctly recognised as vanilla. Not strong but still there. In addition to this the flavor remotely reminded me of burnt sugar. I enjoyed this cigar tremendously while reading a book on my balcony, and before i noticed, i had gone through some 60 pages and a good hour of smoking. Note for the future. I will light one of these up nearly every time when i am not doing a review on a new stick or smoking something from Cuba to celebrate a special moment. As i said before: a great passtime cigar. Just discovered your blog looking for some information on these cigars. I'm smoking the Double Wrap Chairman at the moment and going to review it. They are some great cigars! 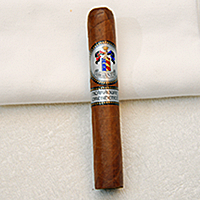 The Maduro line of these cigars is pretty powerful with a good bit of spice. The doublewrap is a pretty cigar, but I found it to be pretty mild. I think these cigars are great smokes and I suspect they are going to be pretty popular in the future. I think an 89 is a fair rating.